After the independence of Singapore from Malaysia in 1965, the fledgling nation braced itself to battle mass unemployment and lack of land and natural resources, and created a robust economic infrastructure by establishing the Development Bank of Singapore (DBS Bank) in 1968. Since its inception, DBS has chosen an ambitious goal of transforming Asia, harnessing the region’s long-term potential as the centre of economic gravity shifts eastward to Asia, outcompeting local lenders by utilizing their deep Asian insights. Through powerful management and financial abilities, it has become a force to reckon with; its strong capital position and AA- and Aa1 credit ratings—that are among the highest in the Asia-Pacific region—earned it Global Finance’s “Safest Bank in Asia” accolade for six consecutive years, from 2009 to 2014. Targeting inclusive growth, on the one hand DBS actuated the economy towards development of Singapore, zeroing in on the small and medium enterprises sector and on the other harnessed horizons abroad in pivotal financial domains such as foreign exchange and derivatives, money market and securities trading. DBS Bank fully acquired the POSB Bank in 1998 for SGD 1.6 billion, thus getting hold of the highest number of ATM outlets throughout Singapore. As early as 2003, DBS had established the first real estate investment trust of Singapore to cater to real estate investment demands in the region. It partnered with 34 Middle Eastern investors from prominent families and industrial groups from GCC countries to form The Islamic Bank of Asia (IB Asia) in 2007. In 2010, it became the first Singapore bank to issue UnionPay debit cards in China, and in 2012, it became the first Singapore member of a pilot programme set up by the International Integrated Reporting Council (IIRC), which is focused on enhancing the way companies communicate their strategies and values to stakeholders. DBS Group Holdings delivered record earnings of SGD 3.21 billion for the first nine months of 2014, including net one-time gains of SGD 198 million. Excluding the gains, net profit rose 12% to SGD 3.01 billion. DBS focuses on intermediating trade and investment flows between Asia’s three key axes of growth—Greater China, South Asia and Southeast Asia—as well as participates in Asia’s growing affluence; in addition to its key franchises in Singapore, Hong Kong, China, Taiwan, India and Indonesia. Leveraging digital technology as a means to reach customers across Asia, it focuses on three lines of business: Corporate or investment banking—covering large corporations and institutional investors, SME banking, and Wealth management. In 2012, DBS introduced a New Generation IB Secure Device as part of the financial industry-wide initiative for safer online banking experience. It has market-dominant positions in consumer banking, treasury and markets, asset management, securities brokerage, equity and debt fund-raising in Singapore and Hong Kong. DBS Bank is the largest bank in Southeast Asia by assets, and is counted among the larger banks in the Asian continent. 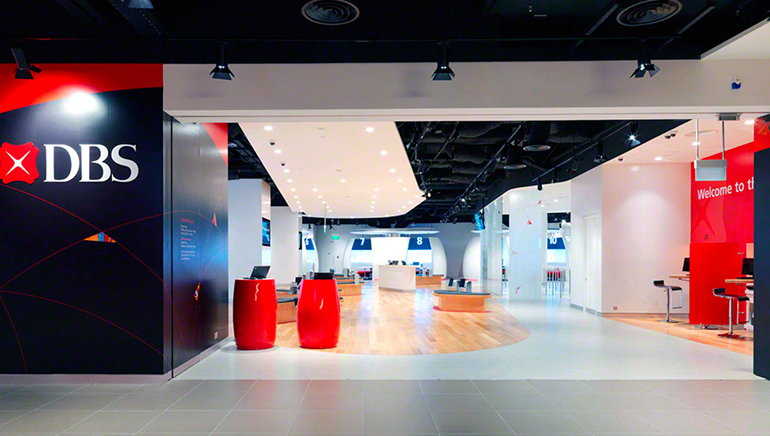 DBS has developed a unique brand of banking, Banking the Asian Way, that’s distinct from the local lenders’ or other global players’. In 1998, DBS Bank merged with POSB Bank, giving it a dominant market share with over 4 million customers. 250+: DBS is a leading financial services group in Asia, with over 250 branches across 17 markets. SGD 50 million: It recently established a SGD 50 million foundation to further its commitment towards corporate social responsibility. 12: Number of branches DBS operates in India. 2.4 million: The number of Internet banking users of DBS in Singapore as of 2013. 1100: Number of ATMs DBS owns in 50 cities across Asia.